1. I have slight obsessive compulsive tendencies, including a need to do things in groupings of five and all like objects must be grouped. If my knife handles are not all facing the same way, it bothers me until they’re fixed. 2. My favorite pizza is pepporoni with pineapple. 3. I have an obsession with bunny slippers and am on a quest to find or make the perfect pair. 4. I love to read boring non-fiction books like textbooks. If I’m learning, I’m happy. 5. I will put bacon on anything…ok, almost anything. 6. Most days, I do not change out of lounge/PJ pants; I have a great dislike for jeans and will avoid them until I absolutely have to leave the house. 7. I have aspirations to be a pattern creator, yarn dyer and “great” internet blogger. 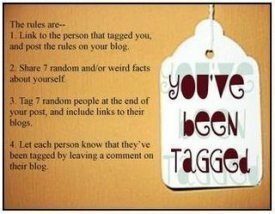 I won’t be doing any tagging as the two people I know read this blog, already have done this meme or been tagged. First of, I hope everyone had a happy Thanksgiving full of yummy food and lovely time with family! Second, I’m making good–but slow–progress on my next knit: the Shetland Shorty in Wollmeise. So far, so good. Yes, it really is THAT bright of a pink, red, and orange. Holy Bright Colors, Batman! So far, I’m really loving it next to green-ish blues and can’t wait to have it off needles to wear. It’s another stupidly simple lace pattern, so let’s hope I do not muck this one up. I find it rather funny that it took me so long to make the knitting pattern that put the want of knit into me in the first place, but I’ve finally done it. I’m rather glad I didn’t do it as a beginner, because I think it would have been a rough early project. I’m happy with the shape of the bear, but I think that the order of the directions stinks and I plan to tinker with it in the future to make the assembly easier. (It’s knit all in one piece minus the arms which you pick up after stuffing…and it’s a pain to knit them at that point.) As can be seen, I altered it from the get-go to be a panda rather then a plain colored bear. I bought some plain black felt for the eye area and used safety eyes rather then embroidering them on. I’m particularly pleased with how the nose came out; it’s very neat and nice looking for me! I have found that I’m becoming spoiled by my Knitpicks Harmony needles: the Clover DPNs felt too blunt and clumbsy to me. I should look into getting a set of the Harmony DPNs in the larger sizes. I’m finally starting to get my knitting groove back. The Green Gable is finished after one day shy of three weeks worth of work, I’ve started a Panda bear for my son, and I have yarn caked for my next couple of projects. Win all around. I’m still trying to decide how I feel about this one; it’s not horrible, but it’s not my favorite knit so far. I think the choice of neckline isn’t the best for me and I won’t be making a second of these. I’ll have to wait until I’m done nursing to decide about a few of the other issues I noticed, but I think that is the main culprit for them. The top appears to be a bit short, although I checked it I don’t know how many times when finishing it. Between trying it on when I finished it two days ago and today, the top seems to have lost about 1/2″ in length. Mysterious. It also pulls up when I lift my arms. This is why I need to learn to do short rows in the bust area. Lessons learned? Short rows and I will be good friends because I will likely never lose enough bust to fit standard pattern sizing. I have to stop putting off learning how to do them. For some reason, they intimidate me a bit and my eyes glaze over when I read directions on how to do them. Must focus. These are my yarn cakes. Soon, they shall be a pair of Jaywalker socks (YarnPirate BFL in Cupcake), and a Shetland Shorty (Wollmeise in “Sleeping Beauty”), respectively. Yarn cakes are so pretty. Now if only my son would stop running off with them and pretending to eat them. After a few more Me projects, I’ll need to start on the baby gift for my friend. So far, I plan to span at least two different crafts and it very well may be the Gift Package of Doom. What can I say? I get excited when my friends have babies. I just found out that a good friend of mine is expecting her third baby, and I have already commenced with plotting all the things I will smother them with depending on if it is a boy or a girl. I won’t go into details here, since she might be reading this, but I’m plotting, oh yes, I am plotting. Thought I’d post up some pictures of my last pair of Monkey socks and my Green Gable–slowly but surely chugging along on that one. I’m finally past getting the sleeves onto waste yarn after more then a week. I’m not used to going so slow when I knit. First the Monkey socks. I’ve been pleasantly surprised at how much I like the Bayfield Apple colorway. There was color pooling on the Gusset, but everywhere else, it did some beautiful striping. And my “Green” Gable in Cotton Fleece; the color is Rue and very pretty dark French blue. I’ve been happy so far and as usual, am having to knit a weird custom inbetween size, but it’s coming out nicely. I’m not dead, just learning to cope with having two small children home with me all day. It’s cutting into both my sanity and my knitting time–my means for keeping my sanity with my hyper toddler o’ doom in the first place. The newborn phase is almost done and I’m hoping that in the coming weeks we’ll have a more solid schedule and everyone will calm down and return to something closer to what normal was. 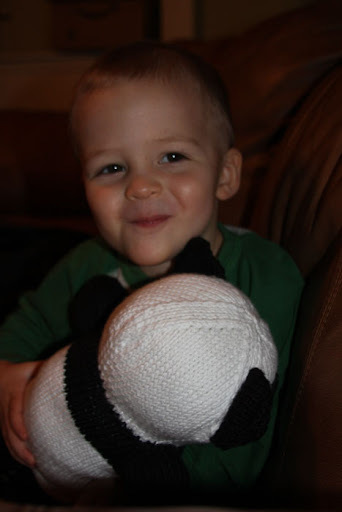 Anywho, this is a knitting blog, so back to what little knitting I’ve been getting done these past six weeks. The “Lady” sweater is finished: just needs to be blocked, ends woven in, and buttons sewed on. I’m not as happy with it as I imagined I’d be, but some of that may be from my irritation at the lace pattern and all those missing stitches. I think once it’s fully finished, I’ll be happier with it. Right now, I’d prefer not to look at it and leave it where it is for the time being. Once the “Lady” sweater was complete, I broke out my new toy: a ball winder I was able to buy thanks to a 50% off coupon from JoAnn Fabrics. So far, it’s been fun to play with. That is my Yarn Love in Bayfield Apple I had been wondering what to do with. It became a pair of Monkey socks that took me over two weeks to knit, which was strange as I’m used to working so fast. (No pictures of the socks for now, I need to get pictures taken of the FO and do an FO post eventually here.) The socks took just under half the skein and I’m unsure of what to do with the rest. I guess I’ll eventually make more socks, or I’ll be on the look for anyone from Ravelry who may have an equivalent amount in another colorway. Honestly, I’m not sure where the figure that an average pair of socks takes 400yds of yarn comes from anyway: I think at most, my socks take 230-240yds, and my feet aren’t even that small, they’re average size. Now, I’m working on my Green Gable after having the yarn for it sitting in my tote for about a year. I mucked up the lace a bit–what is it with me and these easy patterns lately? !–but it’s not noticable and I’m not ripping back for that. If all goes well, I’ll have pictures and another project in the near future.